Over the summer I was leafing through a new cookbook and stumbled upon a recipe for fish, one that mentioned in the introduction that it was THE FISH — poisson meunière — that Julia enjoyed during that fateful lunch in her new country. Of course I felt compelled to make it immediately — that very evening — and I commented afterward that it rivaled any seafood I’d had in a restaurant, high-end or otherwise. I repeated that the second time I made it. And the third. The ingredients are humble. The preparation, nothing elaborate. 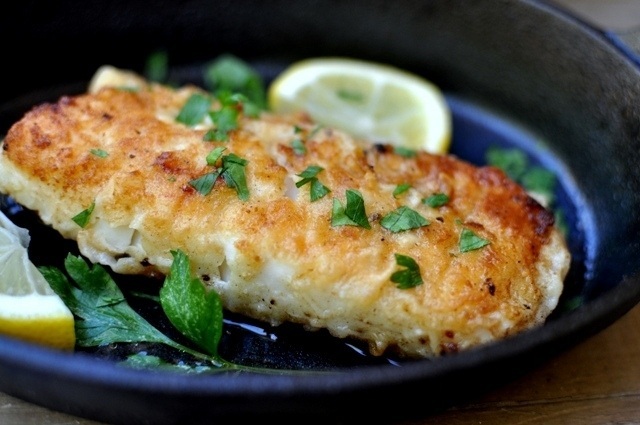 The fish is dipped in milk and lightly rolled in flour before pan-frying. Once brown and crispy, it’s topped with lemon juice, a scattering of fresh parsley and a generous drizzling of brown butter. 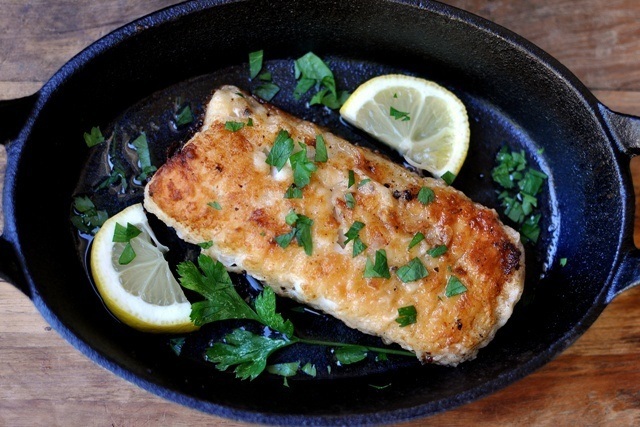 If forced to pick, I’d credit the brown butter for taking the fish to another level, but the lemon juice and parsley balance the sweetness of the butter — and the light dusting of flour makes all the difference in achieving a crispy exterior. All parts work together for a truly sublime dish. Fresh chives are another wonderful garnish for this dish. Add the butter to a heavy saucepan and cook on medium heat until the butter melts, the foam starts to subside, brown flecks appear and the butter just starts to brown. Immediately remove from heat and pour into a heat-safe bowl. It will continue to darken once you remove from heat. It should smelly nutty. If it smells burned, you will have to start over (sorry!). Set butter aside. In a small bowl, whisk together the flour, salt and pepper. In another small bowl, add the milk. Heat a heavy skillet on high heat (no oil) for four minutes. 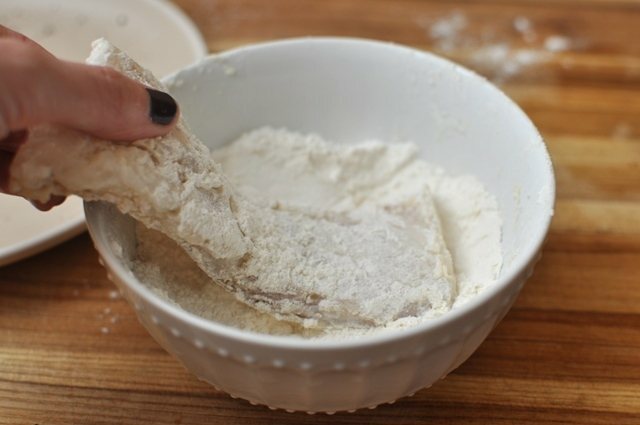 Meanwhile, dip the fish fillets into the milk and then into the flour, tapping off any excess. Add the oil to the skillet, tilting the skillet to coat the bottom. Place the fish in the skillet — carefully, as the oil may splatter. Cook for six minutes undisturbed on high heat. 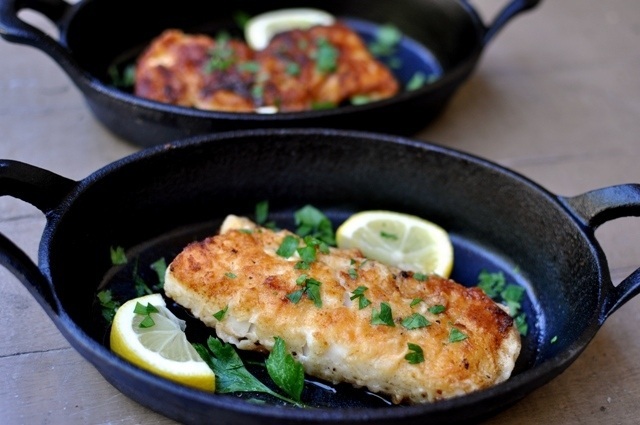 With a spatula, turn the fish over and, if the pan looks dry, add another tablespoon of oil. Turn the heat down to medium-high and cook for an additional 3-4 minutes, give or take a minute depending on the thickness of your fillet. Drizzle the lemon juice on top of the fish followed by a scattering of parsley and a generous drizzling of brown butter. Enjoy immediately, serving with more lemon wedges at the table if desired.